Born in Melbourne, Australia in 1961, Sandra Novello graduated from the teaching College at Melbourne University with a Bachelor of Education degree in 1982. In the same year, she worked as an Artist in Residence at Scotch College Junior School in Hawthorn, Victoria. In 1983, she taught at the senior campus of Marcellin College in Bulleen, Victoria for several years. After her fourth child was born she began working as a Casual Relief Teacher in several schools. While teaching at the Casey Grammar School (Victoria) in 2010, she was inspired to write her first book “Clive the Clever Crow” while teaching some of the younger students. After reading Clive's letter to the children and seeing the expression and delight on the children’s faces, she decided to continue writing more Children’s stories. Imagine going into your room, over to your dresser drawer where your socks are stored neat and safe, only to discover they are all missing. Where could socks go? This is exactly what Suzie thought when she discovered she would have to begin the adventurous game of seeking out her socks as they were hiding from her. Come join Suzie and help her find her silly socks. 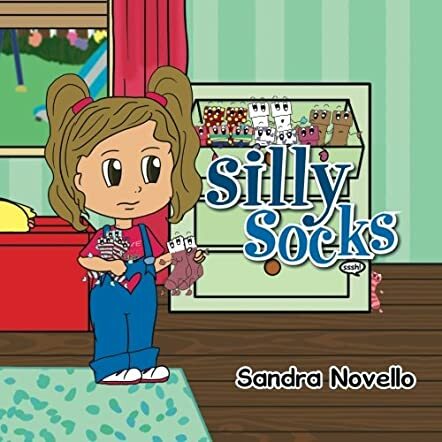 Silly Socks, written by Sandra Novello, is a delightful children's book introducing young readers to critical thinking, rhyming, new vocabulary, and a fun hide and seek type game. Author Sandra Novello has created a lighthearted children's educational and pictorial book. The book is filled with vibrant and creatively drawn illustrations as well as a fun, well rounded and age appropriate word structure and vocabulary, sure to excite and enhance the imaginations of young readers everywhere. Young children more often than not love to play games rather than read. It is in their nature to be busy, energetic, and having fun. The author has taken those youthful qualities to heart and created a story that any child could relate to as it has similar qualities to the game of Hide and Seek. Parents and teachers alike can utilize this book as a listening and critical thinking device, and use the object participation game to enhance their children or students' educational skills. With a parent or guardian, the story can come to life as children search for their own missing match or pair of socks in their own drawers. Overall, Silly Socks is an exciting, entertaining short story for both parents and teachers as well a young child to enjoy together.